It’s hardly hyperbole to state that the Fifties and Sixties represented a golden age in Finnish architecture and design, their influence still felt in the work of a great many contemporary studios. 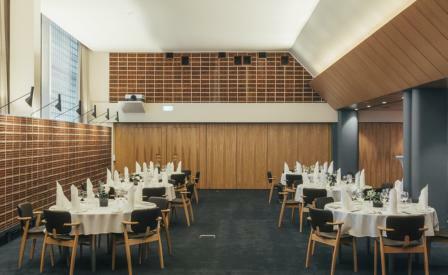 This explains the quality of timelessness evoked by the refurbished Palace Restaurant, its views of Helsinki’s harbour, the market square and the old town much as they were when the Viljo Rewell-designed Palace Hotel opened in 1952. SARC Architects worked with the Helsinki City Museum to reconfigure and protect Olli Borg’s original features like the mahogany and elm panels in the ceiling and the lobby area, while Stockholm-based Note Design Studio added fresh earthy colours, mustard terrazzo, customised pink serving trolleys, and re-upholstered Borg’s original furniture. The light-infused space sets the stage for executive chefs Hans Välimäki and Eero Vottonen to present their take on modern Finnish cuisine including truffle-scented turbot, and Challans duck breasts, their earthiness nicely balanced with sour plums and cabbage.